How did I not know this book existed until now! 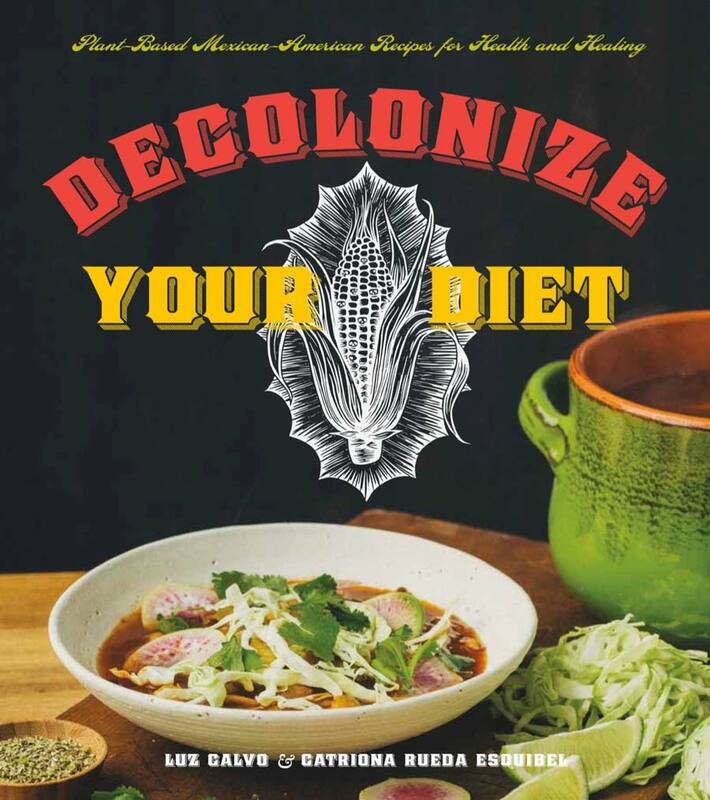 Decolonize your Diet by Luz Calvo and Catriona Rueda Esquivel is part manifesto, part cookbook, and part love story. It is a book that hopes to impulse a movement to help others heal their bodies, reclaim the culture of their ancestors, and revolt against the colonial systems that aim to suppress indigenous traditions. It all begins when Luz is diagnosed with breast cancer. This forces her to reexamine not only what she had been feeding her body, but to come up with a plan to survive the cancer. This led to her doing extensive research on breast cancer in Latino communities and what she found began a whole new way of life for both Luz and Catriona. In her research it was clear that immigrant Latinos had significantly lower breast cancer rates than those born in the US. 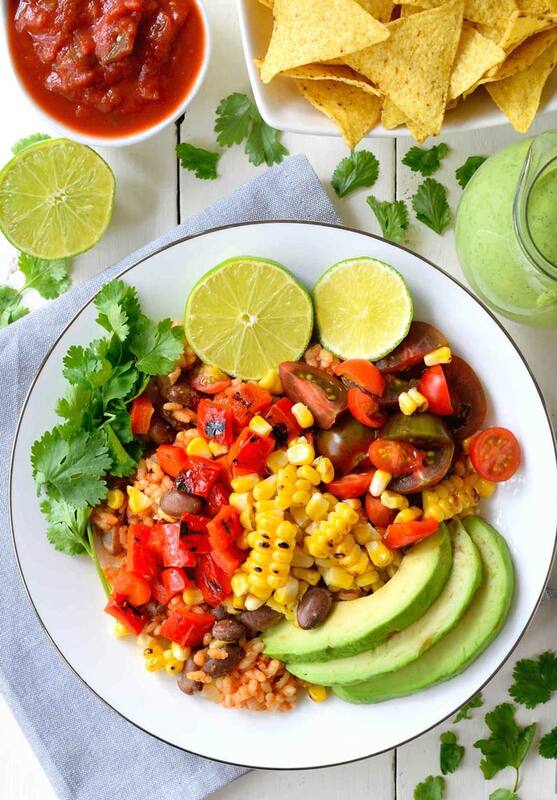 Primarily, because immigrants led a diet closer to that of their ancestors, based on beans, corn, squash, wild greens, nopales, fresh fruit, nuts, and seeds. After this discovery, Luz and Catriona began to decolonize their diet. The book also touches on how decolonizing your diet fits in perfectly with the Chicana/o movement, in that it aims to preserve our indigenous cooking traditions. This part in particular pulled at my heart strings. I am technically not a chicana myself, because I was born in Mexico, though I have been living in this country for 13 years. 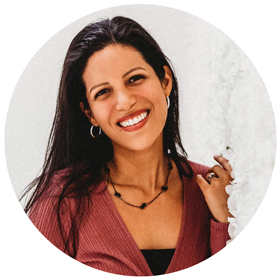 My children however are chicanos, and as a mom it feels like every day is a fight against a culture that is not my own. I speak only Spanish to them, I cook Mexican food at home, and we continue traditions that my mother taught me, and her mother taught her. I want them to be proud of their heritage and a big part of that is food. Just like Luz and Catriona say in their book, food is a nexus connecting generations. 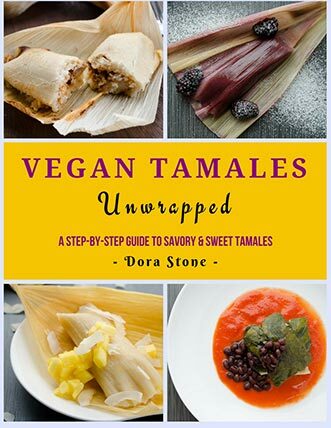 There are over 120 recipes in this book, not all of them are vegan, but most of them include a vegan option. The recipes are wonderfully researched, the cooking techniques explained in detail, and there’s even a section with menu ideas. My favorite ones so far are Verdolagas & Nectarine Summer Salad, Chipotle Pumpkin Soup, and the Tlacoyos con Quelites. Thank you, Luz and Catriona, for the inspiring me to continue to publish plant-based recipes that honor Mexican culture and traditions. I hope to meet you guys some day and maybe share a meal that honors our ancestors! You can purchase Decolonize Your Diet on Amazon, Barnes & Noble and Indibound. 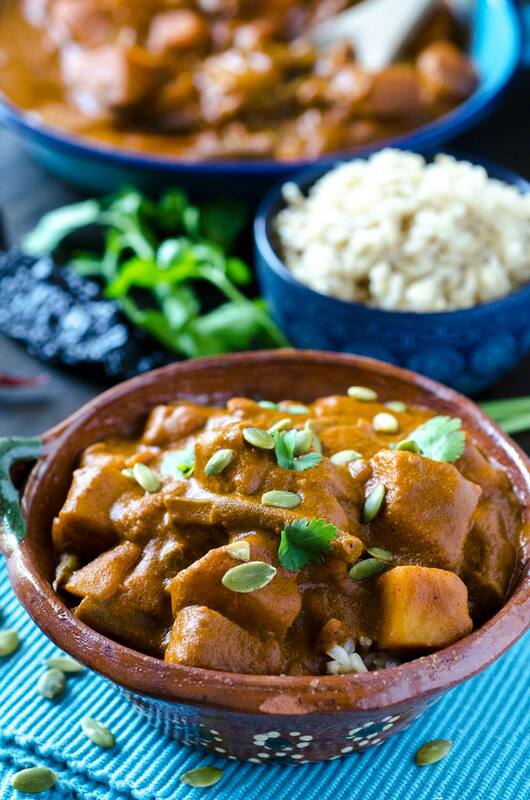 I have chosen this Pipian Rojo Over Rice recipe to share with you, because it is perfect for the coming fall and winter months. The sauce is a hearty, stick to your ribs kind of sauce, made with roasted pumpkin seeds, roasted tomato, and dried pasilla, arbol, and ancho chiles. The sauce is served over potatoes, green beans, and chayote. You can serve this over a bed of rice with a green salad. Enjoy! 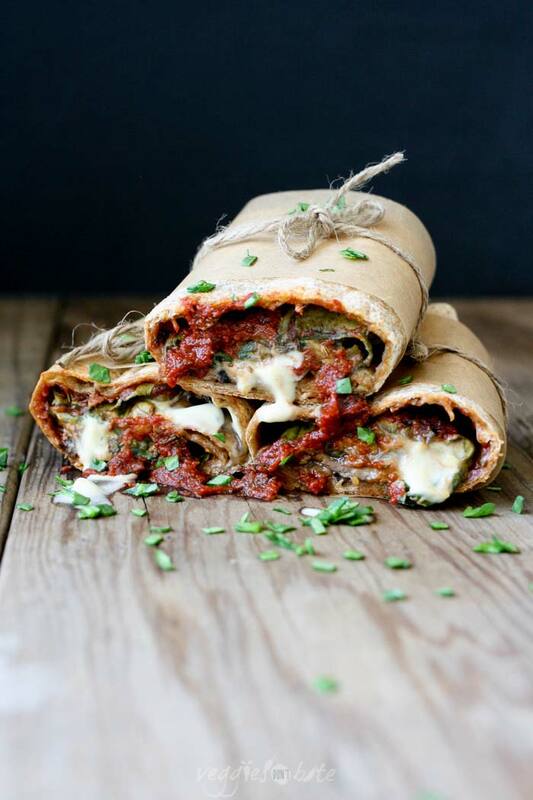 Recipe from the book Decolonize Your Diet by Luz Calvo and Catriona Rueda Esquibel. Recipe used with permission from author. On a griddle on medium high-heat, toast corn tortillas until crispy and slightly charred. Set aside. On the same griddle, toast dried chiles for 1 minute on each side, taking care not to burn. Put chiles in a bowl and cover with boiling water. Use a small plate to keep chiles submerged for 30 minutes. On same hot griddle, slightly char onions and garlic, about 4 minutes. Peel garlic and place it with onions in blender. Put whole tomatoes on griddle and turn often to char on several sides, then add to blender. When chiles have finished soaking, drain, and add to blender. On same hot griddle, toast pumpkin seeds until they begin to puff up. Reserve 1/4 cup of pumpkin seeds for garnish, and add the rest to the blender. On griddle, toast allspice and peppercorns for a few seconds and add to blender wth achiote, salt, and pepper. 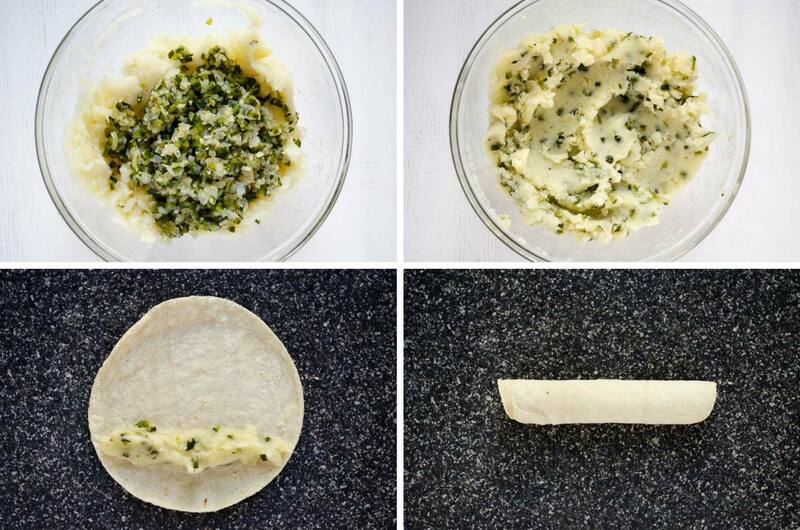 Break charred tortillas into quarters and add to blender. Purée until ingredients form a smooth sauce. If necessary, work in batches or add a small amount of water to blender to process smoothly. Sauce should have the consistency of a tomato sauce or just a little bit chunkier. 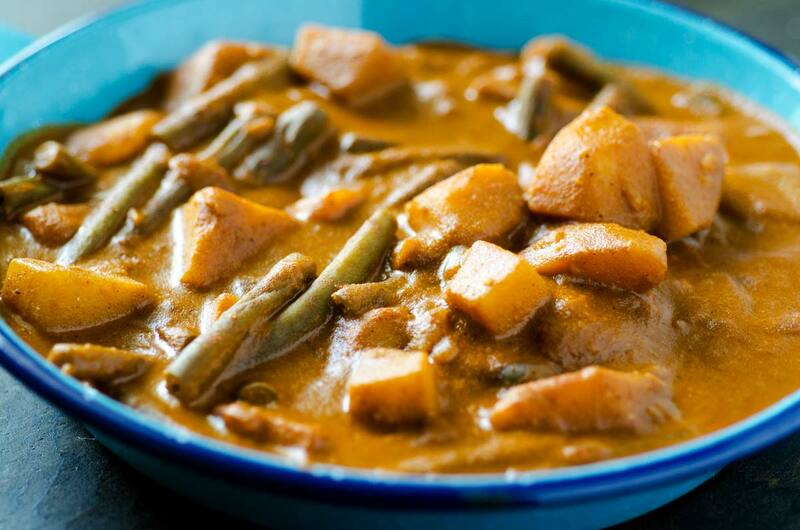 Coarsley chop potatoes, green beans, and chayote into hearty, bite-sized chunks and set aside. In a large pot on medium heat, sauté onions in olive oil for 5 minutes. Add garlic and stir until fragrant. Add potatoes, green beans, and chayote and stir to combine. Season vegetables with salt. Add just enough water to cover vegetables and bring to a boil. Stir in pipian sauce. Lower heat to medium simmer, stirring occasionally, for about 30 minutes or until vegetables are fork-tender. Adjust seasonings. Divide rice between bowls and serve pipian over rice. 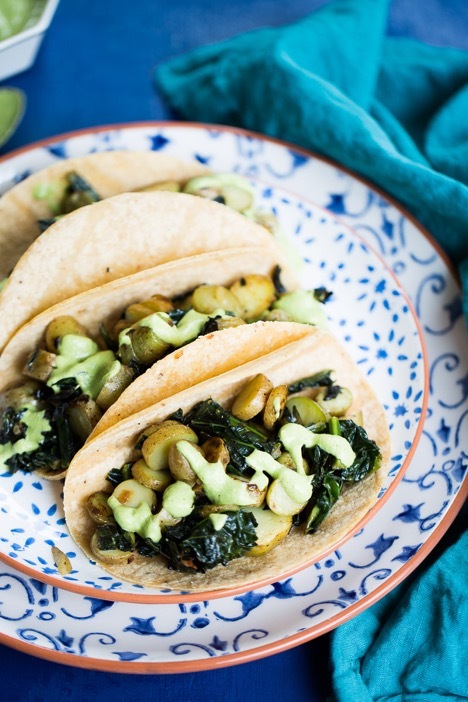 Garnish each serving with a drizzle of pumpkin seed oil, pumpkin seeds, and cilantro leaves. Disclosure: I received a free copy of this book to complete this review. 09/24/2017 /0 Comments/by Dora S.
These vegan chiles en nogada will transport you to the city of Puebla in the fall. 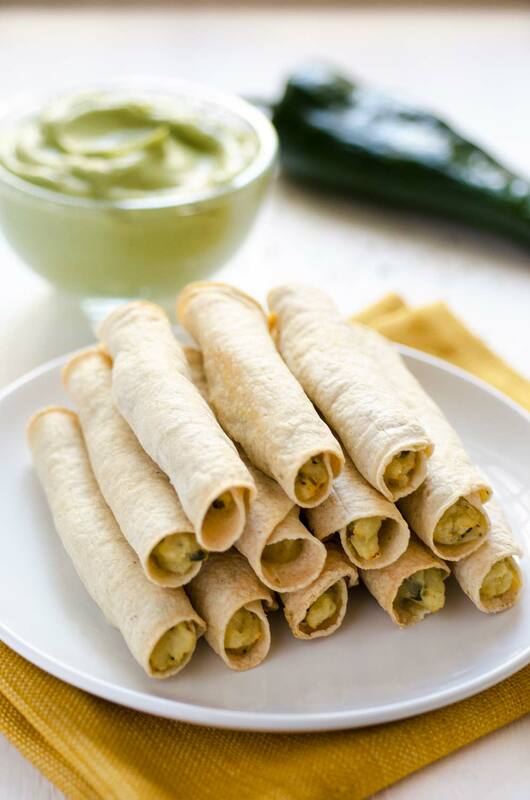 This dish is one of the stars of Mexican cuisine, because it perfectly embodies why Mexican cuisine was declared Intangible Cultural Heritage of Humanity in 2010. It is painstakingly laborious, but don’t worry I have adapted it so you can make it at home in less than an hour. A roasted poblano chile is stuffed with a picadillo of pork (lentils in this version), sautéed in onion, garlic, and tomato puree with almonds, apples, olives, plantain, pear, capers, and raisins. It is bathed in a walnut cream sauce and sprinkled with pomegranate seeds. 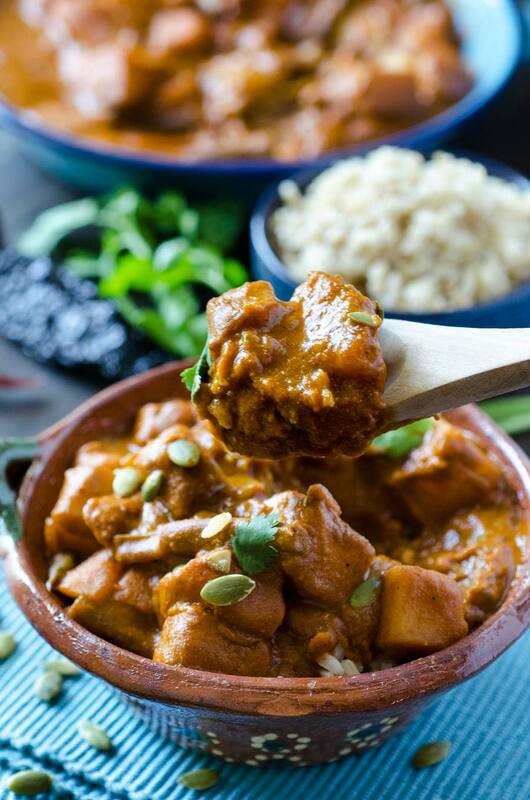 The earliest versions of this dish can be found in cookbooks as early as 1817, and there are several theories or legends as to where it originated. Some say that the Agustinian Recollects of the Convent of St. Monica created the dish in honor of the emperor Agustin Iturbide who was in town and had played an important role in the recently won war for Mexican independence. The dish was meant to symbolize the three colors of the Mexican flag green, white, and red. Another version says that three soldiers of Agustin’s regiment were returning home to Puebla after the war was won, and their girlfriends wanted to prepare a special dish for them. They each found an ingredient that represented the colors of the Mexican flag and said a prayer to our Lady of the Rosary and St. Paschal Baylon, thus chiles en nogada were born. 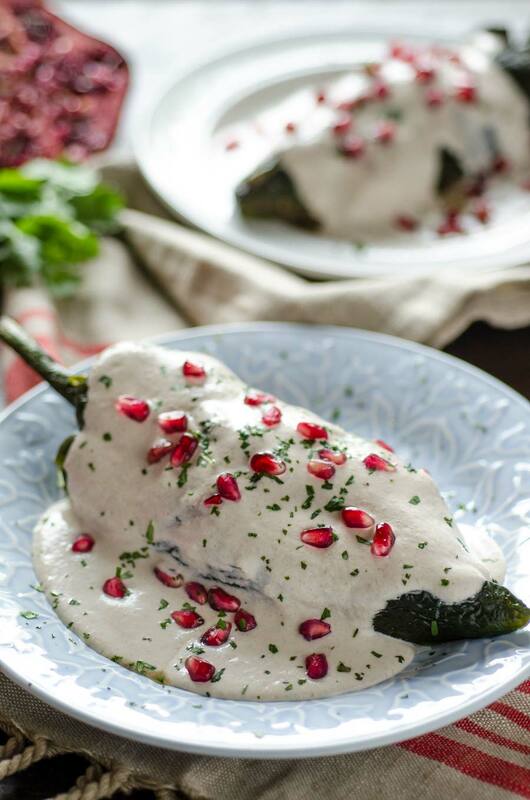 Regardless of their true origin, chiles en nogada today is a very popular dish only available in the fall, since it uses completely seasonal ingredients found in Puebla. 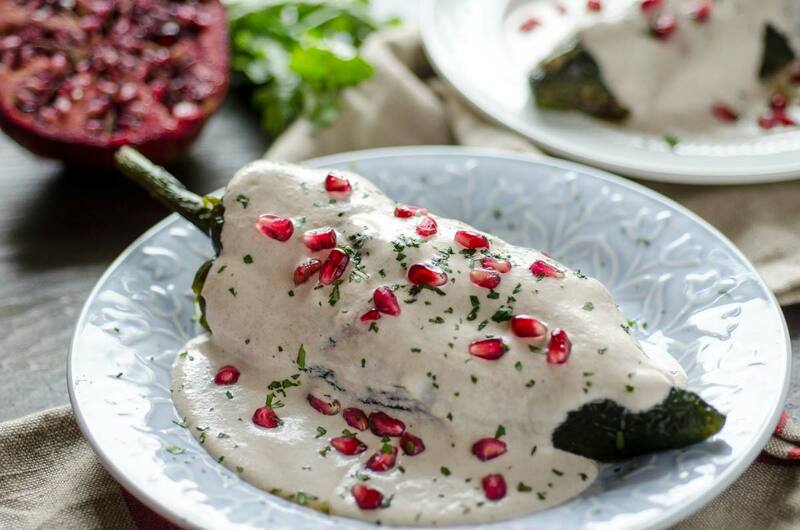 Chiles in nogada season is highly anticipated in Mexico as it is a reflection of our national pride and the celebration of Mexico’s independence which is celebrated on September 16. 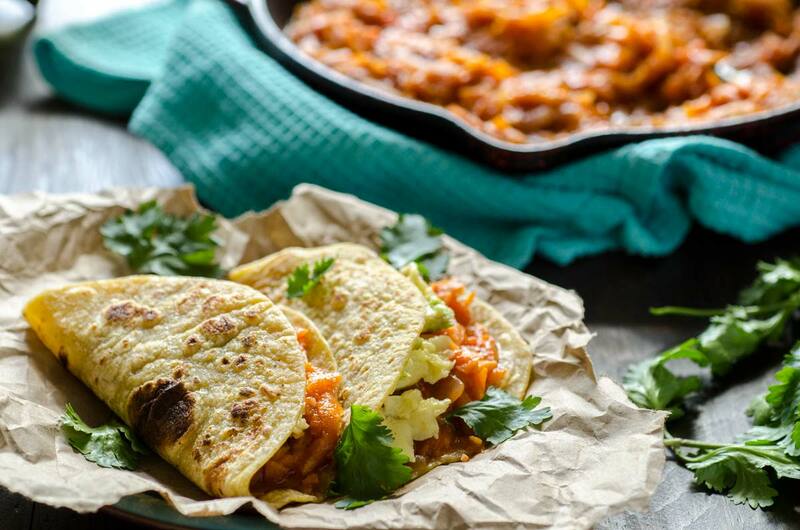 Mexican cuisine is deeply integrated into the history, culture, and the community identity of the Mexican people, and this dish is only one example of the beauty and richness of it all. You can add peach to the picadillo, but I prefer to leave it out. Traditionally the walnuts are peeled, but this takes insanely long, so instead I have just soaked them the night before. Instead of lentils you could use beefless crumbles, TVP or jackfruit. ¡Enjoy! 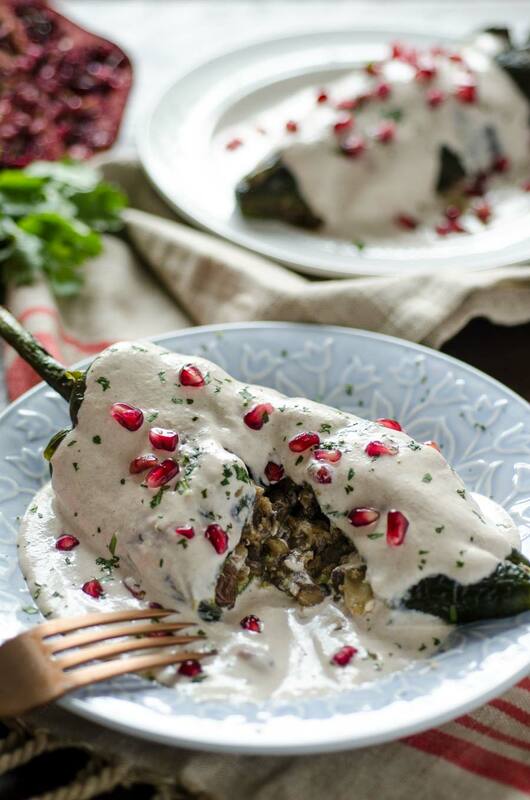 Vegan Chiles en Nogada, roasted poblano chile is stuffed with an aromatic picadillo, covered in walnut cream sauce and pomegranate seeds. 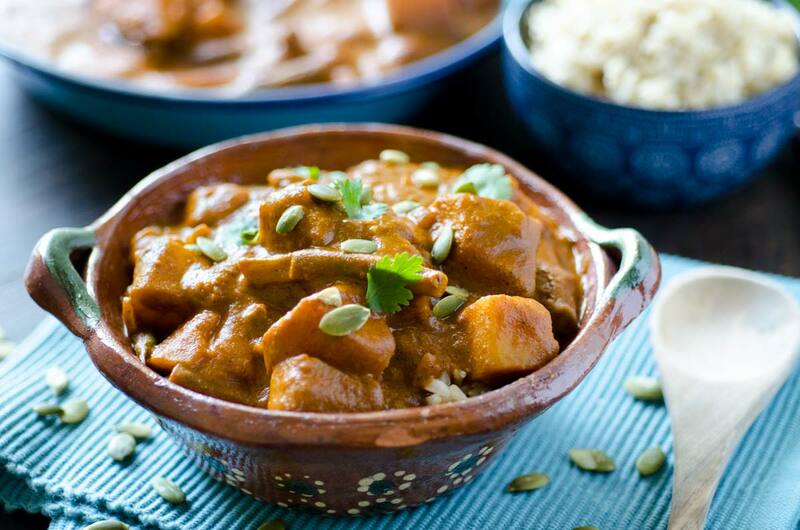 Fill a medium pot with water and add lentils, ½ of an onion, and 2 smashed garlic cloves. Bring to a simmer over medium heat and cook until tender, about 20 minutes. Remove from heat and set aside. While the lentils are cooking, place the two tomatoes and the poblano peppers on a sheet tray. 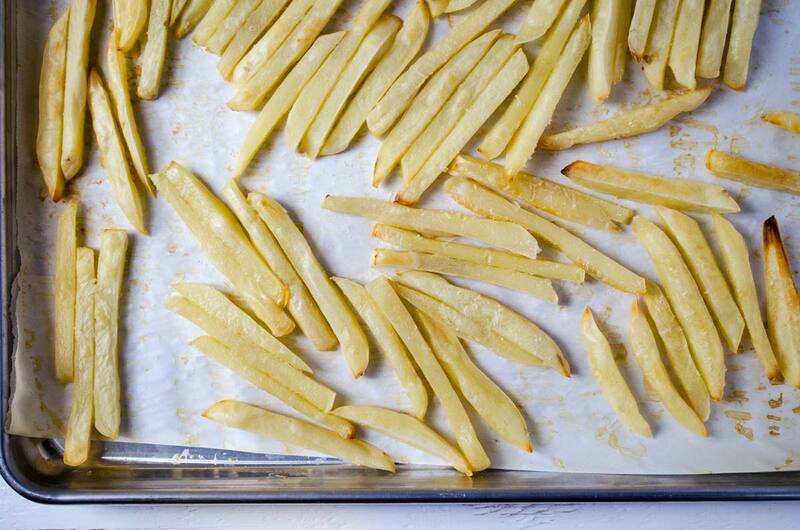 Turn your oven broiler to high and place sheet tray on the top rack of the oven. Let them cook for a couple of minutes on each side until the tomato and the chiles begin to soften and have black spots all over. Remove from heat. Place the tomates and chiles in a bowl and cover with plastic wrap. Let rest 5 minutes. Drain the lentils, reserve 1 cup of the lentil cooking liquid, and using a potato masher, mash them to break them up. Peel the poblano peppers, make 1 cut lengthwise with a knife, and remove the seeds. Set aside. 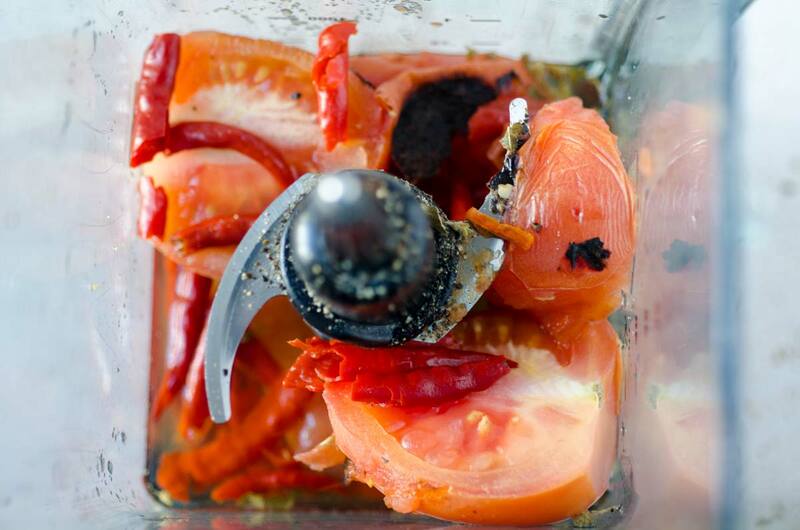 Remove half of the skin off of the tomatoes, and using a blender process them into a puree. Set aside. Set a large pot to medium heat, add ¼ cup of water, and add onion. Cook for 4-5 minutes until onion begins to soften and look translucent. Add garlic and cook for 2 more minutes. Add cooked lentils, mix well, and pour in tomato puree. Let cook for 3-4 minutes or until the puree begins to bubble and change to a darker red color. Add clove, cinnamon, black pepper, plantain, apple, pear, almonds, olives, capers, and raisins. Stir mixture. Add 1 cup of the liquid you reserved from the lentils, and simmer for 20 min or until the plantain is cooke through. Season to taste with salt and pepper. While the picadillo is cooking, soak the cut bread in the cup of almond milk for 5 minutes. In a blender, place the soaked bread and milk, previously soaked and drained walnuts, sugar, and white wine, blend until smooth. Season to taste with salt. It should have the consistency of a cream sauce. If it is too thick, add more almond milk. Set aside. 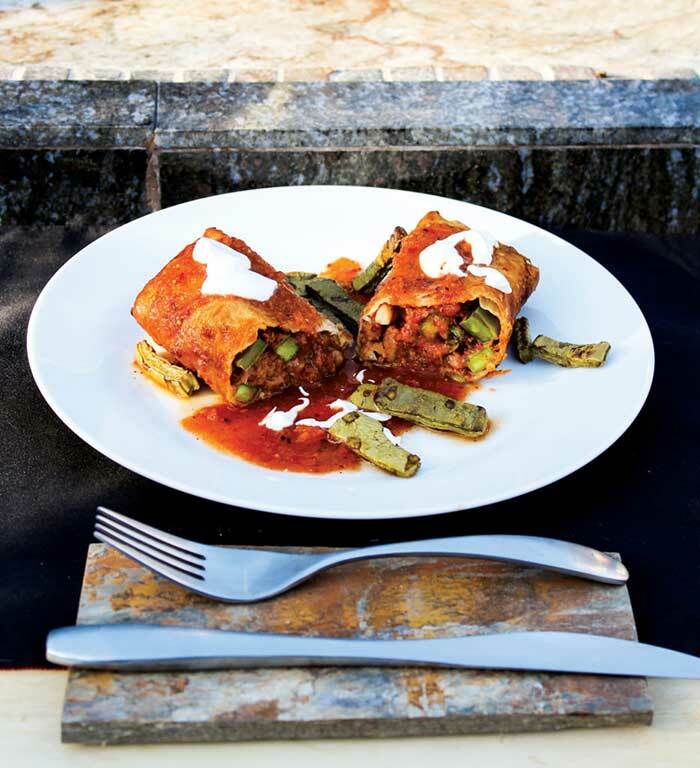 Stuff the chiles rellenos with the lentil picadillo. Place the chiles seam side down on a plate. Pour walnut sauce over them, and sprinkle with pomegranate seeds and chopped parsley. To save time you can buy pre-cooked lentils, and substitute the tomatoes with 1 cup of pureed roasted diced tomatoes (canned). Do not heat up the walnut sauce. 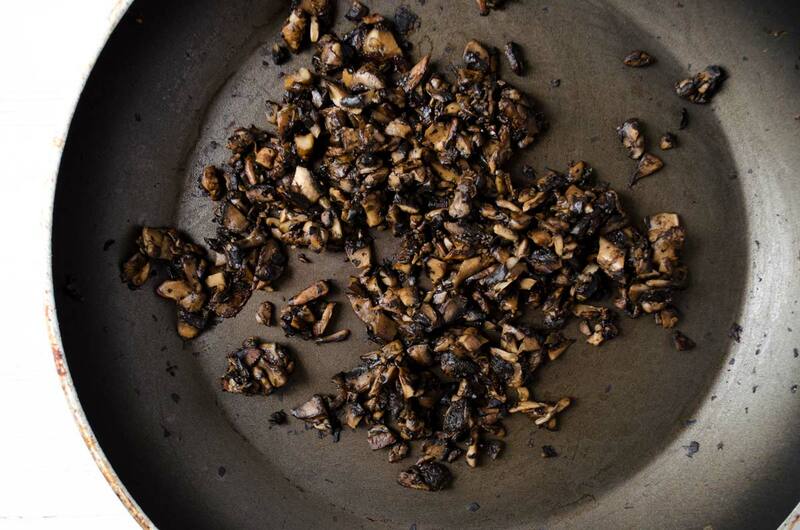 Instead of lentils you could use TVP, beefless crumbles or jackfruit. 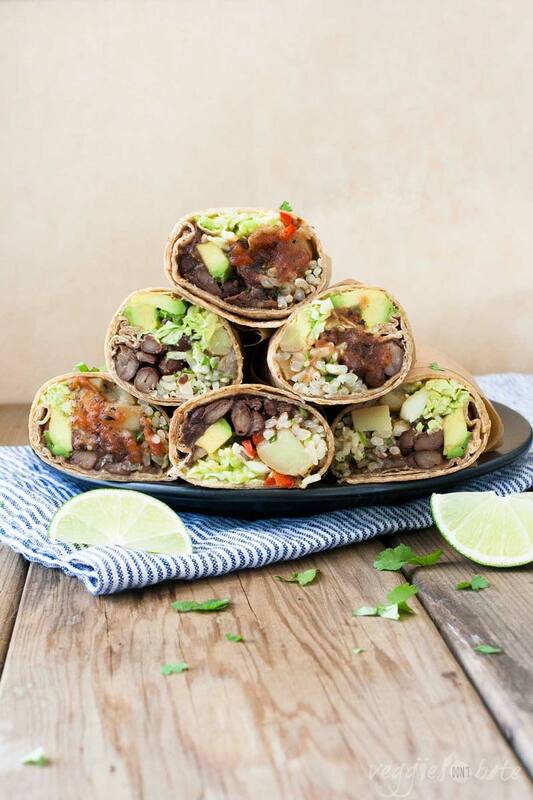 09/05/2017 /0 Comments/by Dora S.
An easy burrito filled with black beans,brown rice, and an awesome chipotle enchilada sauce. Find recipe here. 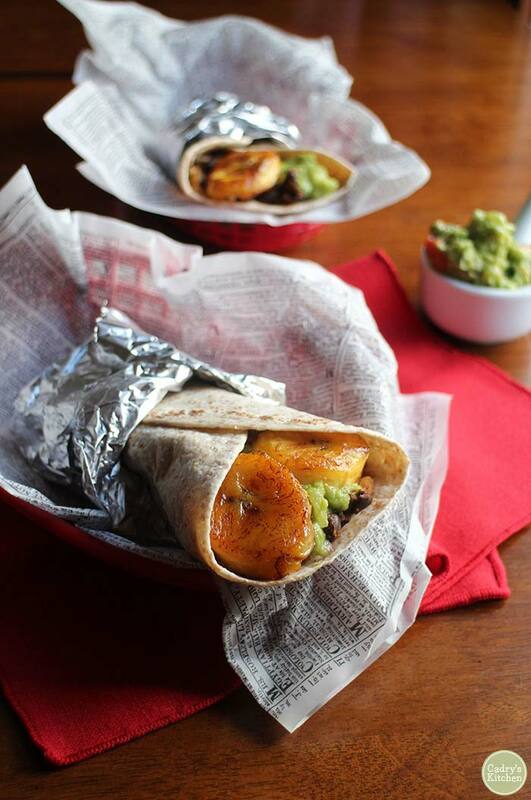 Savory black beans, rice, sticky sweet fried plantains, and a hefty dollop of guacamole. Find recipe here. Stuffed with fries, pico de gallo, portobello asada, spicy salsa, vegan cheese, and guacamole. Find recipe here. Packed with flavor and healthier than takeout. 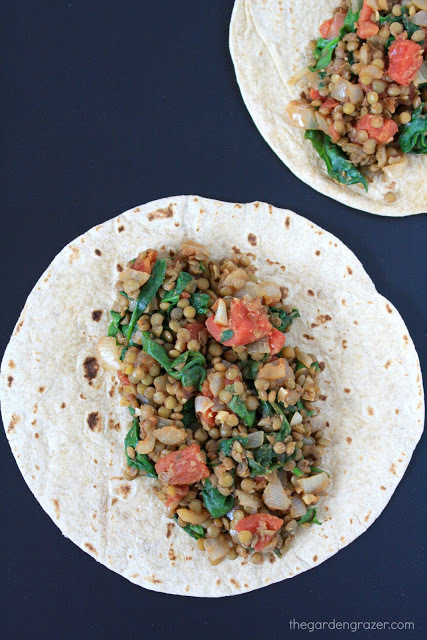 A quick 20-minute meal that will fill you up! Find recipe here. 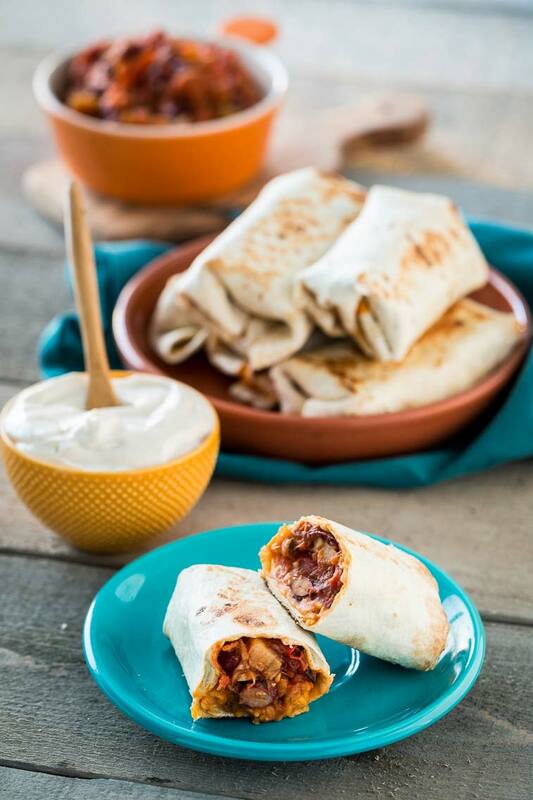 Baked burritos smothered in tomato sauce and zesty avocado lime dressing. Find recipe here. 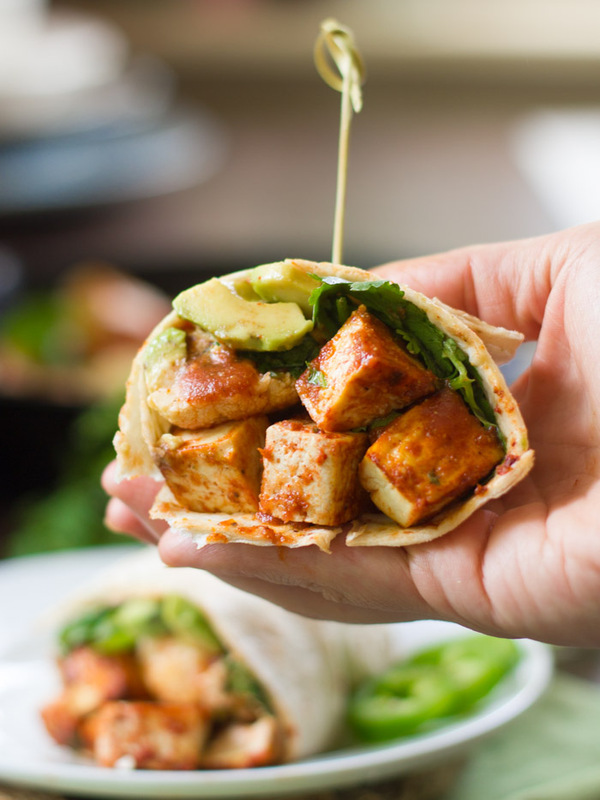 Filled with creamy avocado, roasted cauliflower, baked tofu, and covered in spicy tomato sauce. Find recipe here. Flavorful, healthy, easy, and always satisfying. Find recipe here. 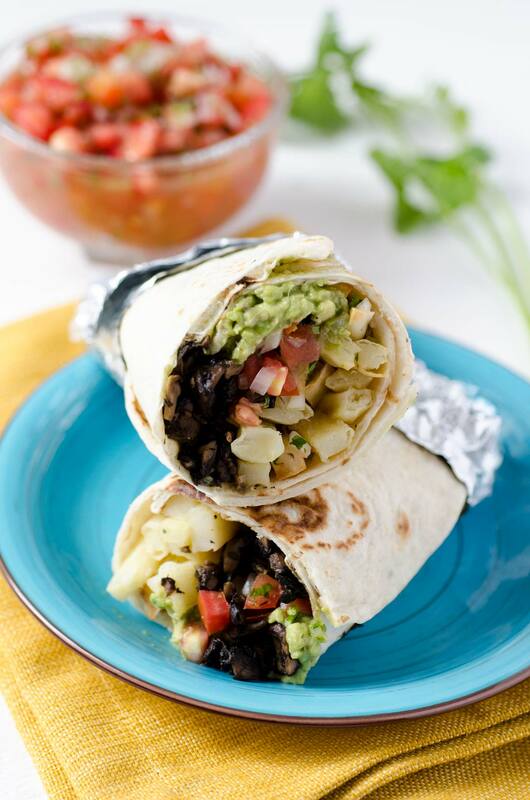 These are hearty, filling and downright delicious, all in 30 minutes or less! Find recipe here. 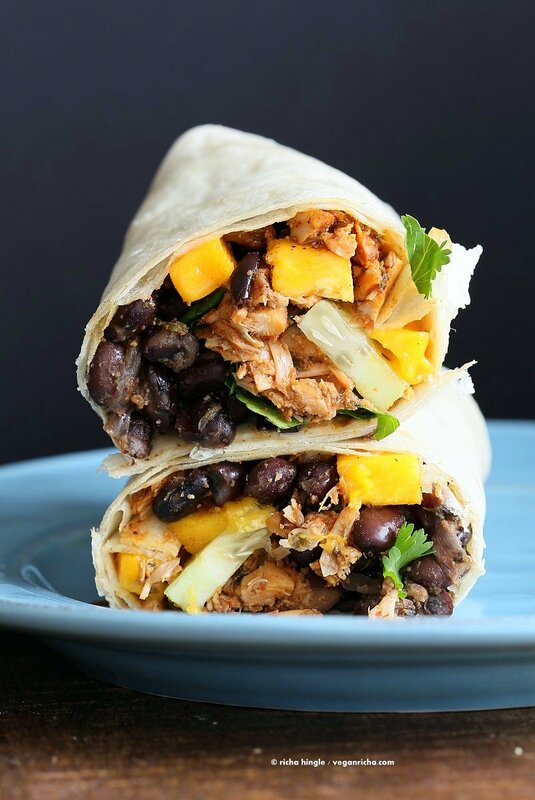 Packed with hot shredded jerk jackfruit, black beans, mango and cucumbers. Find recipe here. 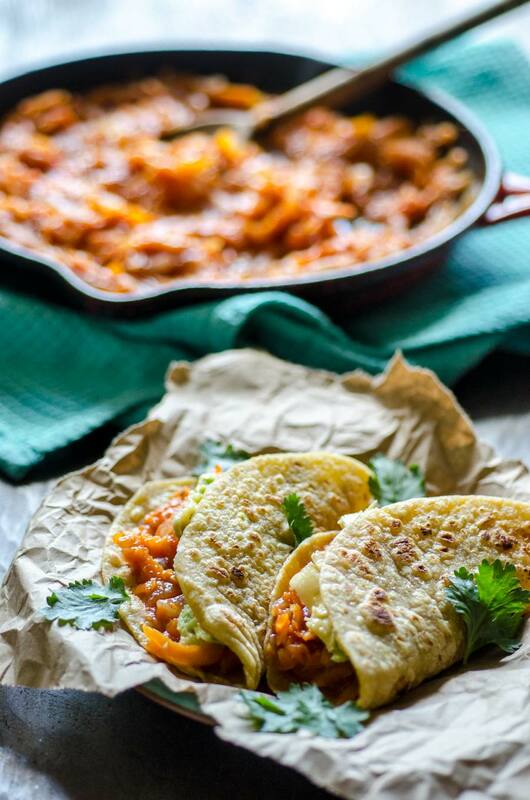 Crispy skillet-grilled tortilla combined with steamy jackfruit chili and melty cheddar cheese. Find recipe here. Filled with beans, mango salsa, tomatoes, spinach, and vegan cheese. Find recipe here. 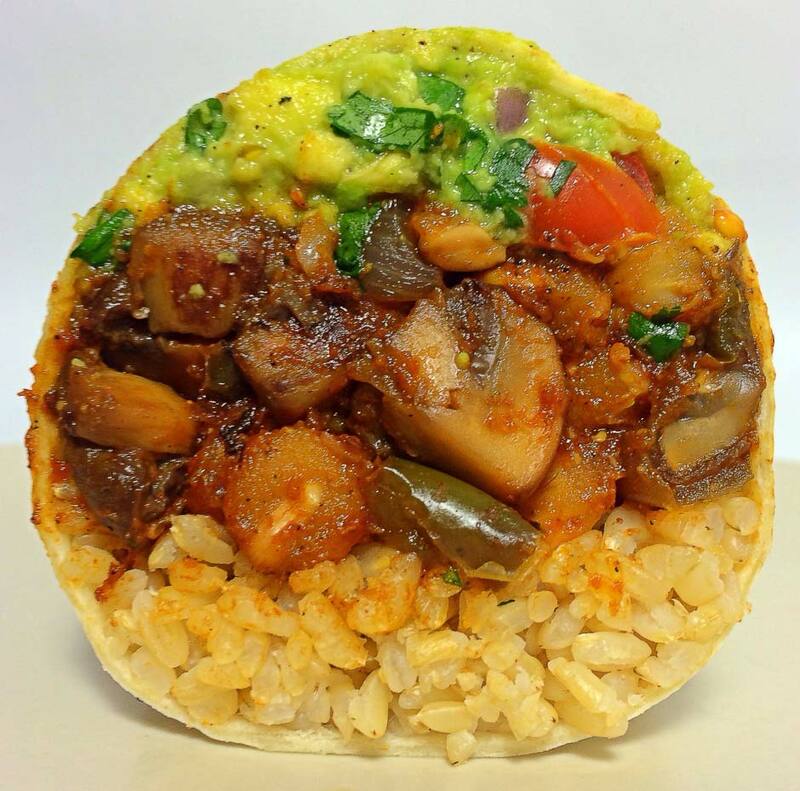 Mushrooms, onions, peppers and hominy in a chipotle sauce, brown rice and guacamole. Find recipe here. Scrambled tofu, black beans, sour cream, salsa and cheese. Find recipe here. 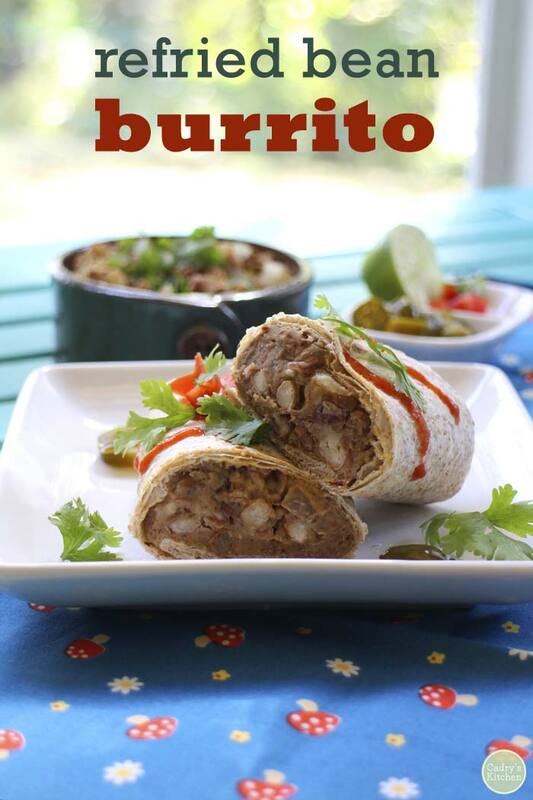 These cozy refried bean burritos make for a very tasty lunch. Add jalapeño slices or hot sauce. Find recipe here. 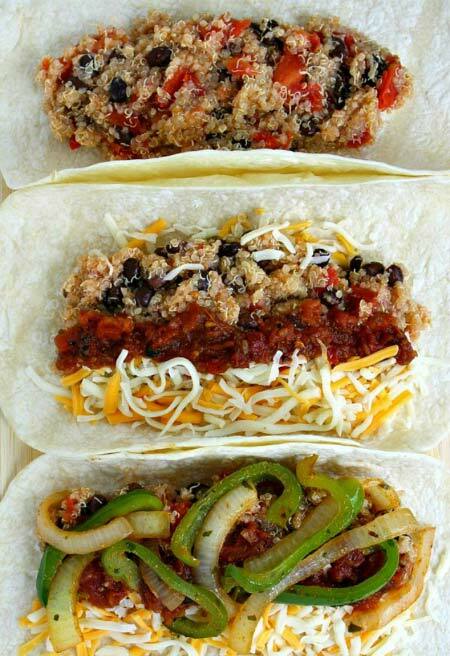 Veggie fajitas, black beans, salsa, cheese, and quinoa! Find recipe here. 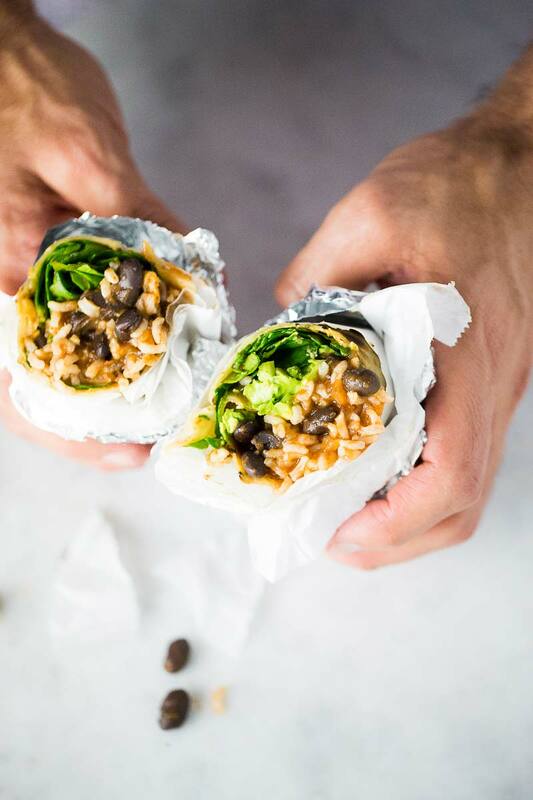 Veggie stuffed burrito smothered in a cilantro cashew cream sauce. Find recipe here. 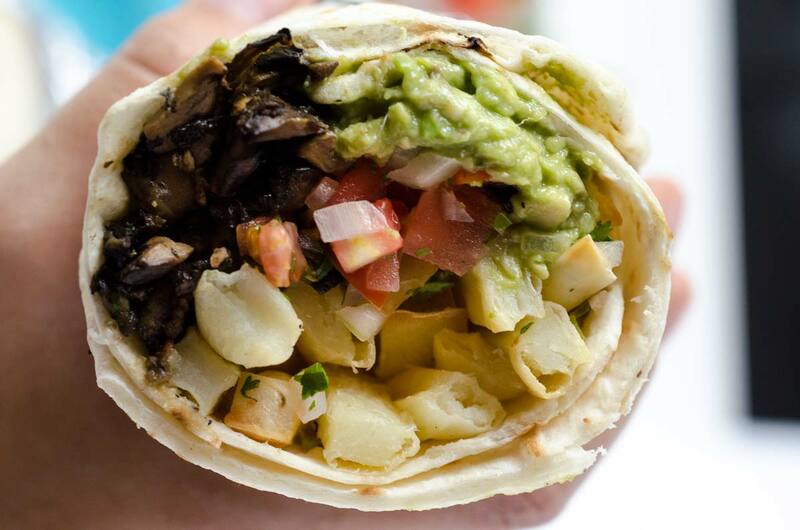 Two favorite foods unite in this ultimate vegan creation. Find recipe here. Deep fried burrito filled with seitan and nopales, and smothered in sauce. Find recipe here. 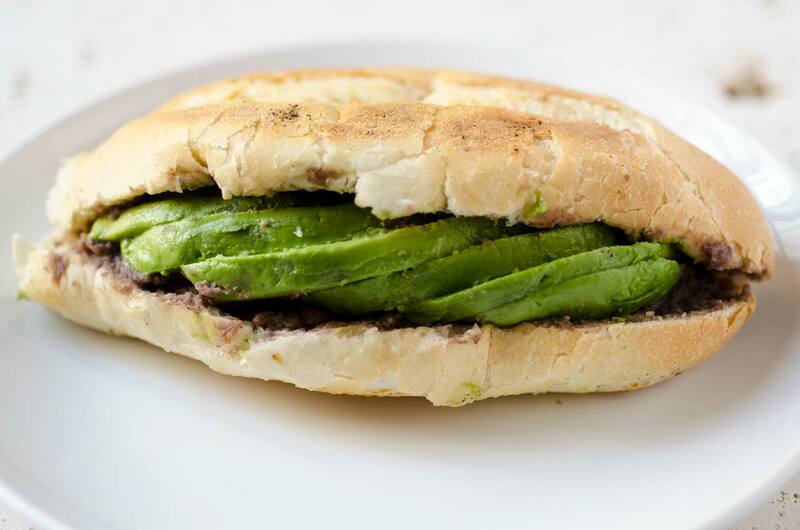 05/05/2017 /8 Comments/by Dora S.
This torta ahogada recipe or Mexican “drowned” sandwich is a crusty bread torta filled with refried beans and avocado slices, and drowned in a spicy chile de árbol salsa. 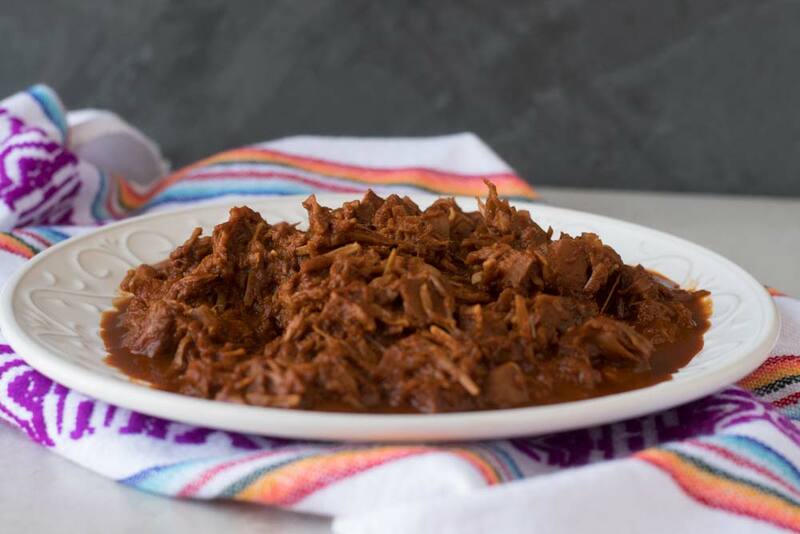 It is a classic dish from Guadalajara, and it is not for the faint of heart or stomach! 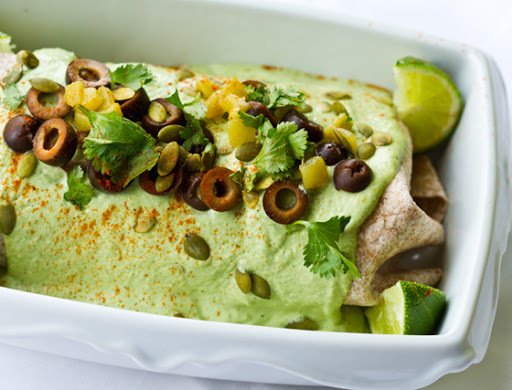 The recipe is from Jason Wyrick’s new book Vegan Mexico. 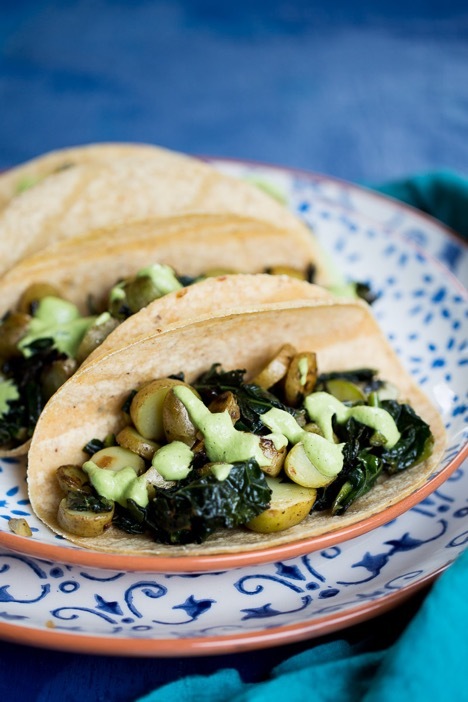 Jason is the chef and author behind Vegan Tacos and the blog The Vegan Taste. 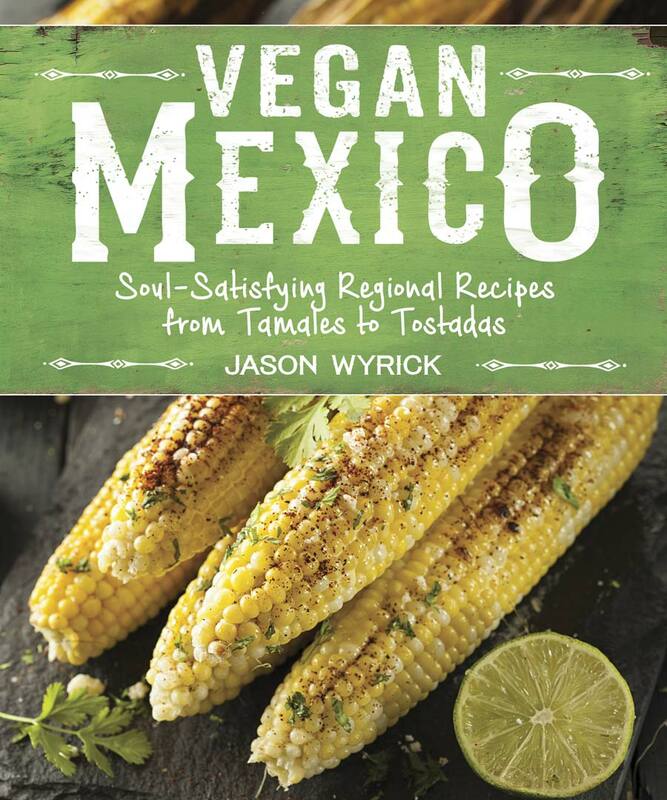 I am a huge fan of Jason and his recipes, so I was very excited when I received a copy of Vegan Mexico. It has taken me this long to write about it (the book was released in December), because I have been immersed in it since the day I got it! 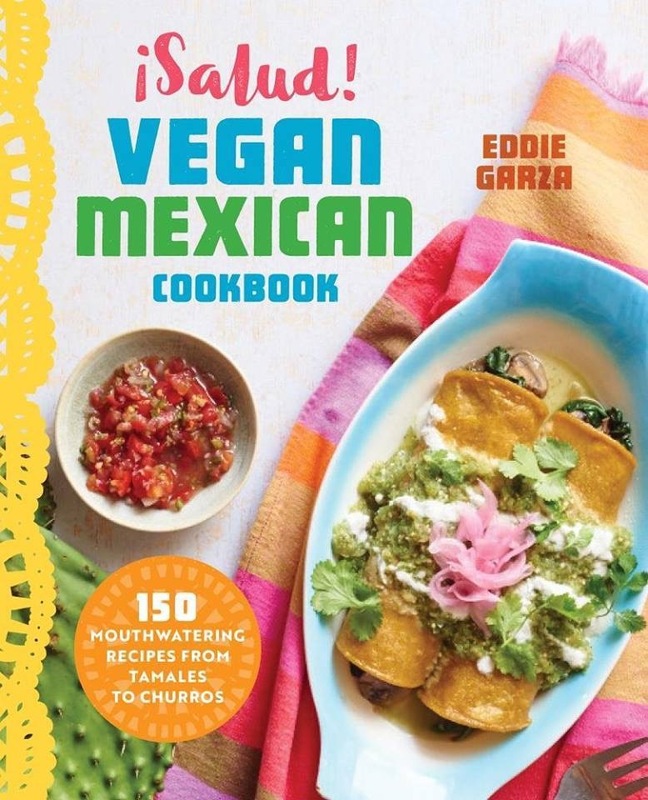 The book has over 100 recipes, all Mexican, and every one of them vegan. The recipes range from very easy to some more time consuming and complicated. My favorite part of the book is the stories and research behind the recipes. 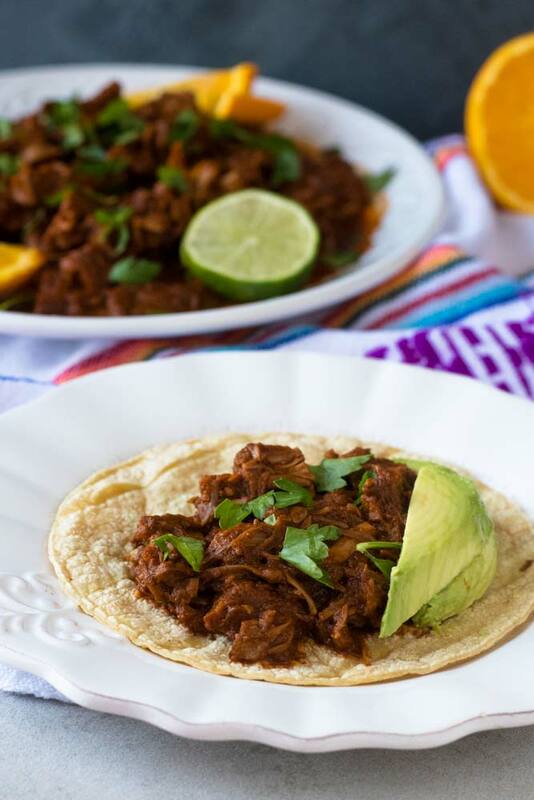 Each recipe giving you a little tid-bit of information on Mexican culture and tradition. It is exciting to see so many of my favorite recipes, and even some that I had not even thought of made vegan. The only thing I would change in the book, would be to add more pictures. There are a good number of pictures, but I think some of the recipes could benefit from step-by-step pictures. 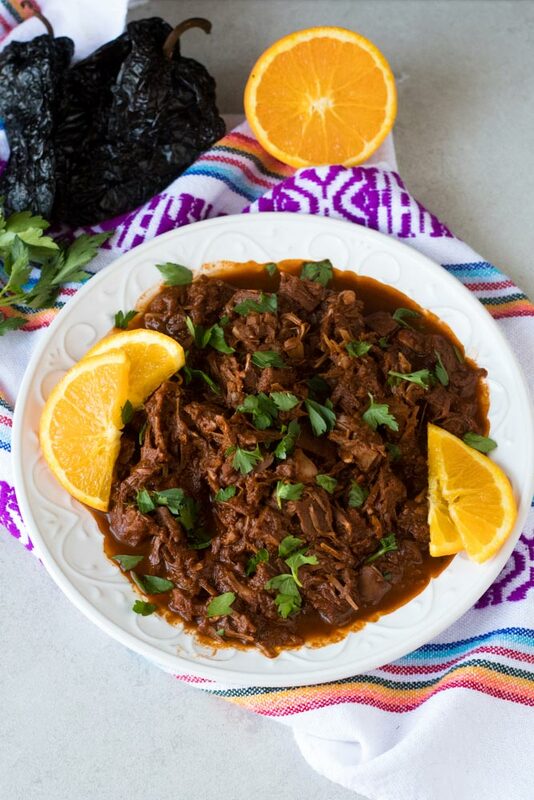 Some of my favorite recipes so far is of course this Torta Ahogada, the Tomato Black Bean Soup, and the Sweet Potato and Black Bean Mole Enchiladas. Jason’s book is available on Amazon in paperback ($12.12) and kindle format ($7.99). This is like Jason Wyrick clearly states in his book, one of the spiciest meals you will ever eat. Legend says the sandwich was invented when a street vendor accidentally dropped a torta in a container of spicy salsa, this drowning it. If you would still like to try this, but aren’t a fan of heat, check the recipe notes for a non-spicy or less spicy version. Traditionally a crusty salted bread called birrote is used, but you can use french baguette or bolillo instead. Enjoy! 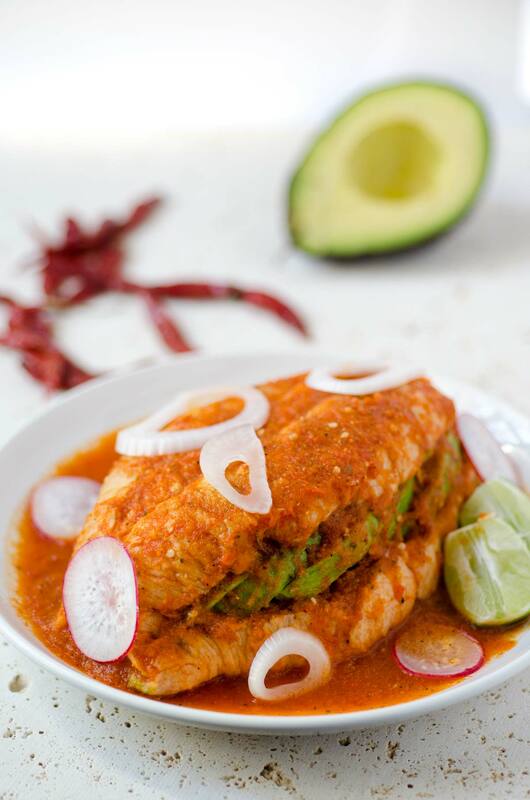 This Torta ahogada recipe is a crusty bread torta filled with refried beans and avocado, and drowned in a spicy chile de arbol salsa. Recipe from Vegan Mexico Cookbook. Lightly toast the rolls or baguettes. Warm the beans and spread them evenly in each roll. Add the avocado slices. 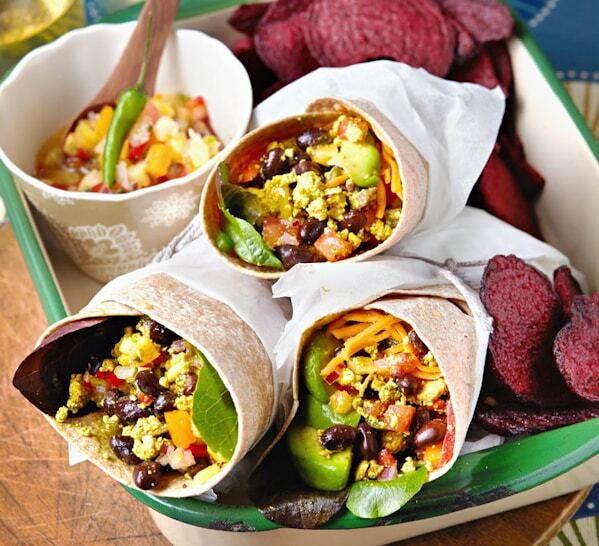 Place the sandwiches in bowls. In a blender or food processor, puree the rehydrated chiles de árbol, garlic, vinegar, water Mexican oregano, cumin, pepper, cloves, and salt. (Strain if you want a very smooth sauce.) Pour the sauce over the sandwiches. Garnish the sandwiches with the sliced radishes and pickled onions and serve with lime wedges. Eat these tortas with a fork and lots of napkins. WARNING: This sandwich is hot, really hot! 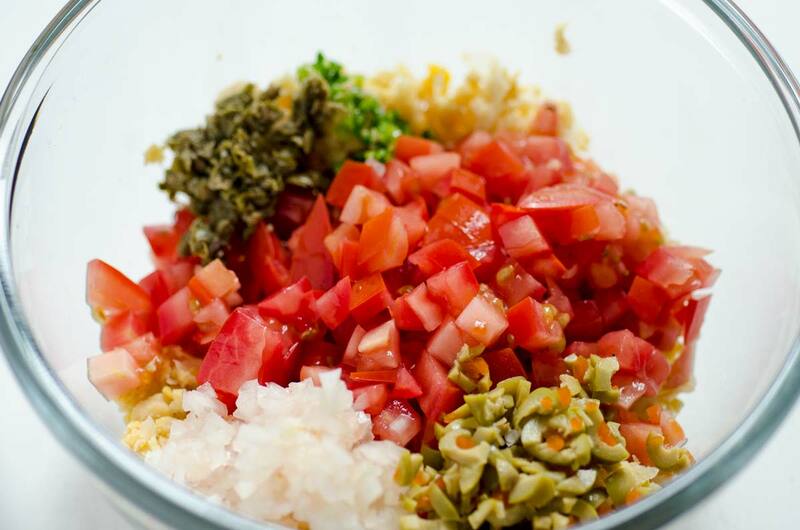 For a less spicy version omit the water and add 1 to 3 cups of crushed fire-roasted tomates to the salsa and omit or decrease the chiles de árbol to your taste. Another option is to make two sauces, a non-spicy tomato sauce and the chile de árbol sauce. This way you can drown your torta in the non-spicy tomato sauce and drizzle some of the árbol sauce on top. 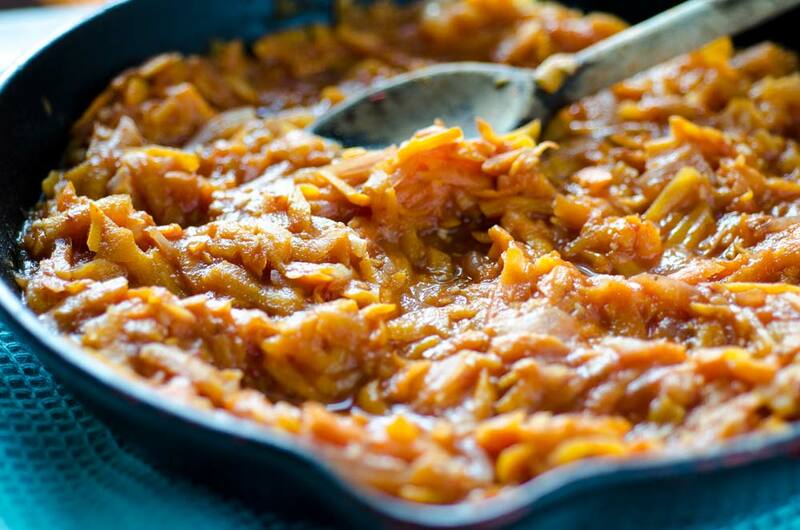 You can find a recipe for pickled onions here and one for refried beans here. 04/03/2017 /2 Comments/by Dora S.
Vegan tuna salad was one of those things I refused to try for a long time. It sounded so unappetizing, I don’t think I was a fan of real tuna salad to begin, with so trying a vegan version seemed almost illogical. When I finally did, I realized I was sooo wrong. I may not have liked tuna, but I certainly do like chickpeas! 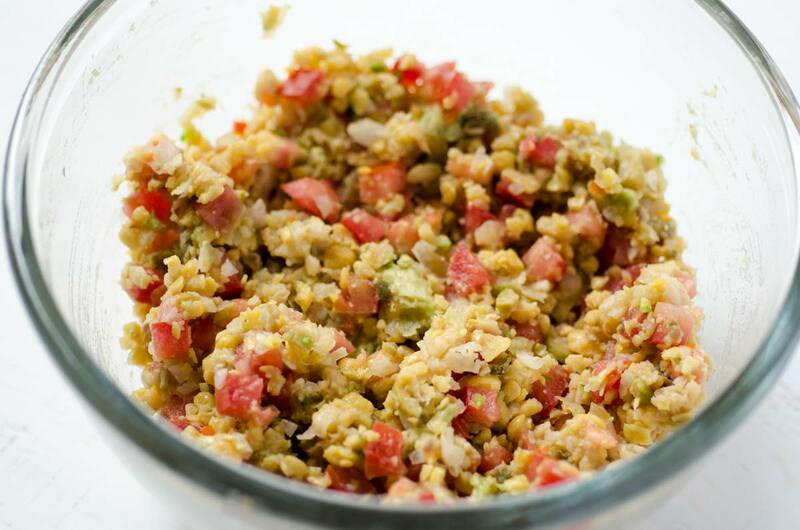 This vegan chickpea tuna salad has mashed chickpeas, tomato, onion, serrano pepper, vegan mayo, olives, and capers. 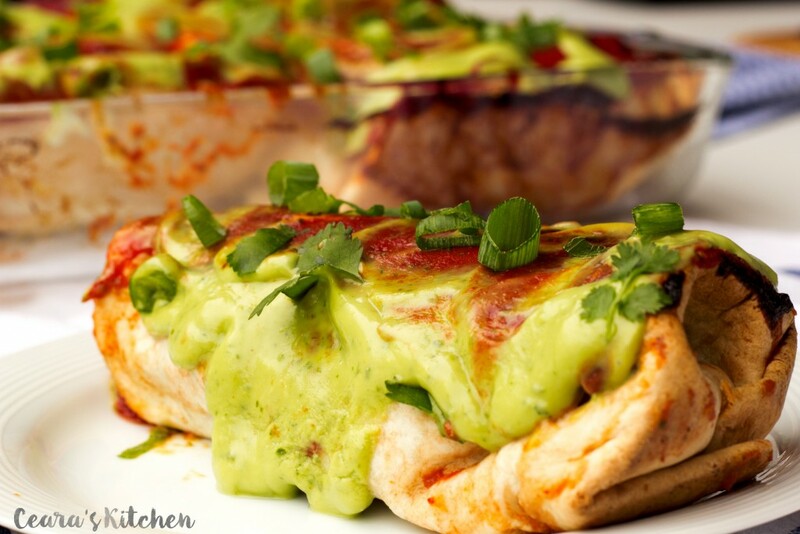 It is just the right amount of spicy and it is stuffed into a roasted poblano pepper. This is another one of those Mexican lent dishes I was talking about last week. It is meant to be eaten cold, like a salad, but if you like it can be eaten warm. If you choose to eat it warm, I recommend serving it with this chipotle tomato sauce. Another way to eat this vegan chickpea tuna salad is in a sandwich, tostadas or with crackers. 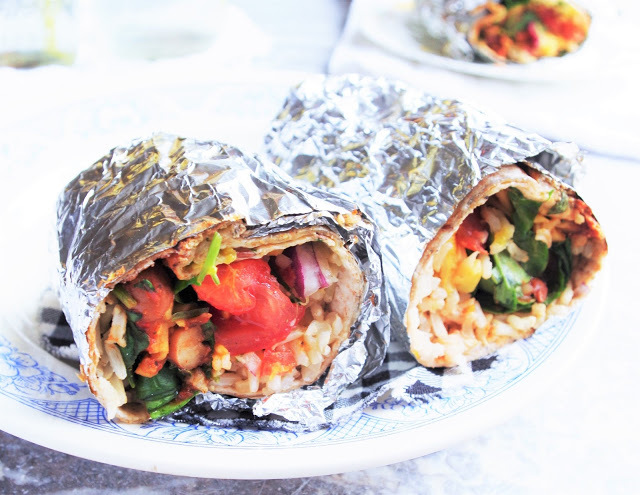 It is perfect for an on-the-go lunch and it is full of protein. I made it just a couple of days ago to photograph it, and my dad asked if he could try it. I was a little nervous since my dad is definitely NOT VEGAN, but he really enjoyed it! 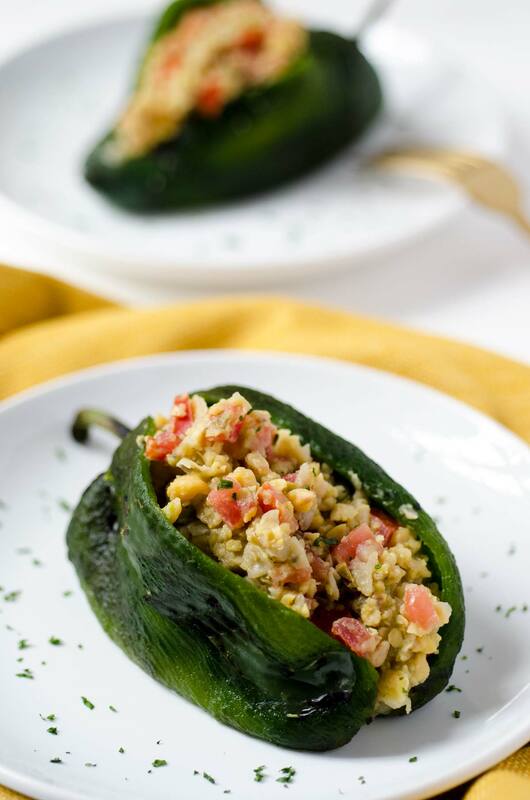 If you are looking for other recipes with poblano peppers you can try this traditional chile relleno filled with vegan cheese and fried until golden brown, or this roasted poblano pepper filled with quinoa and calabacitas and topped with a creamy vegan chipotle sauce. I usually try and find a brand of chickpeas that are very tender and soft. Some are more firm than others, or you can always cook them yourself. The more tender your chickpeas are, the creamier your tuna salad will be. If you can’t find vegan mayo or you are a no-oil vegan, you can substitute the mayo with mashed avocado or this oil-free vegan mayo. Enjoy! Roast, peel, and deseeded the poblano peppers. Set aside. Place chickpeas in a shallow bowl and use a fork to mash them up. Add tomatoes. onion, serrano, olives, capers and mix well. Add the vegan mayo and 1/2 tbsp. of pickled jalapeño liquid or lime juice. Mix well. Season with salt and pepper and taste. If necessary, add remaining 1/2 tbsp. of pickled jalapeño liquid or lime juice. Stuff the poblano peppers with the chickpea salad and serve. If you can't find vegan mayo or you are a no-oil vegan, you can substitute the mayo with mashed avocado or this oil-free vegan mayo. You can also add 1 tbsp. of nori flakes to make the salad more “fishy”. Here is a small tutorial on how to roast poblano peppers. This dish is meant to be eaten cold, like a salad, but if you like, it can be eaten warm. If you choose to eat it warm, I recommend serving it with this chipotle tomato sauce. 03/17/2017 /1 Comment/by Dora S.